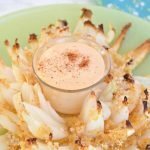 If you love the fried blooming onion appetizer that you find at popular restaurants but don’t want to consume over 1000 calories, you’ll find this healthier baked blooming onion recipe a great alternative. I’m always motivated to eat healthier in January, aren’t you? But I really don’t want to eliminate all my favorite foods. So making healthier versions of my favorites is a way to satisfy cravings without denying myself flavorful foods. I always feel super guilty after eating one because of all the calories they contain! 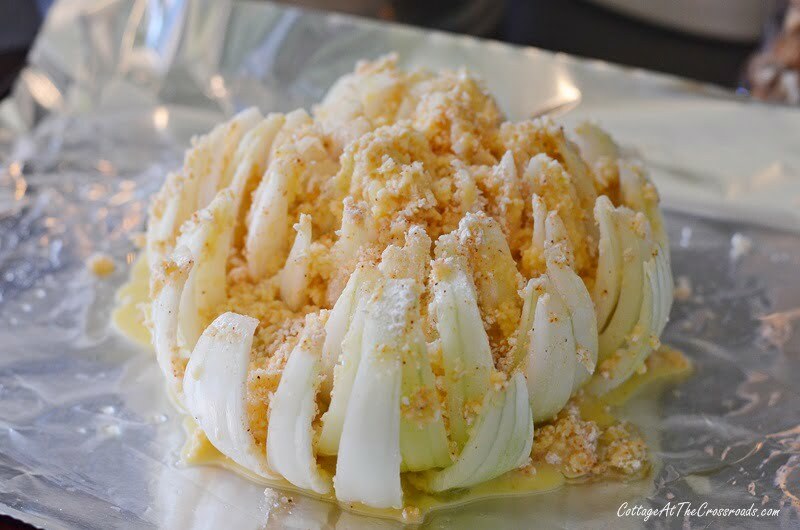 This baked blooming onion recipe is really easy to make at home and will impress any guests that you may be serving. Plus, I’m including a dipping sauce recipe that is the perfect accompaniment. First, you are going to need a very large onion. 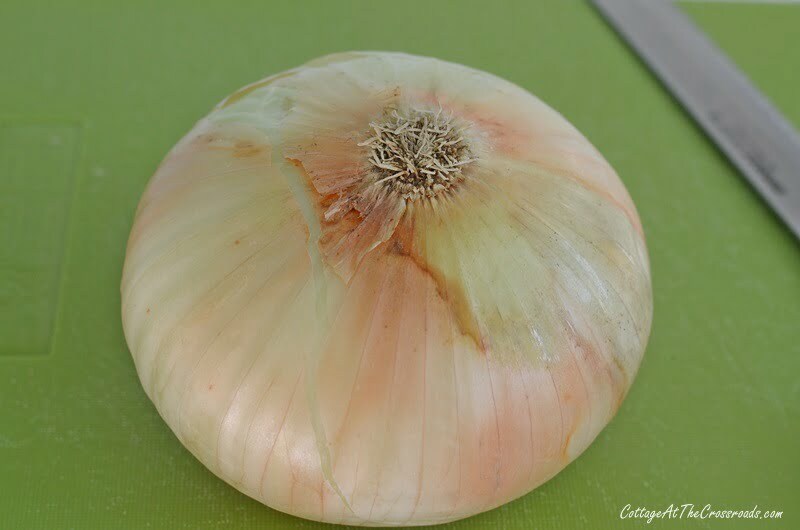 You can use Spanish onions, Vidalia onions, or Texas Sweets. 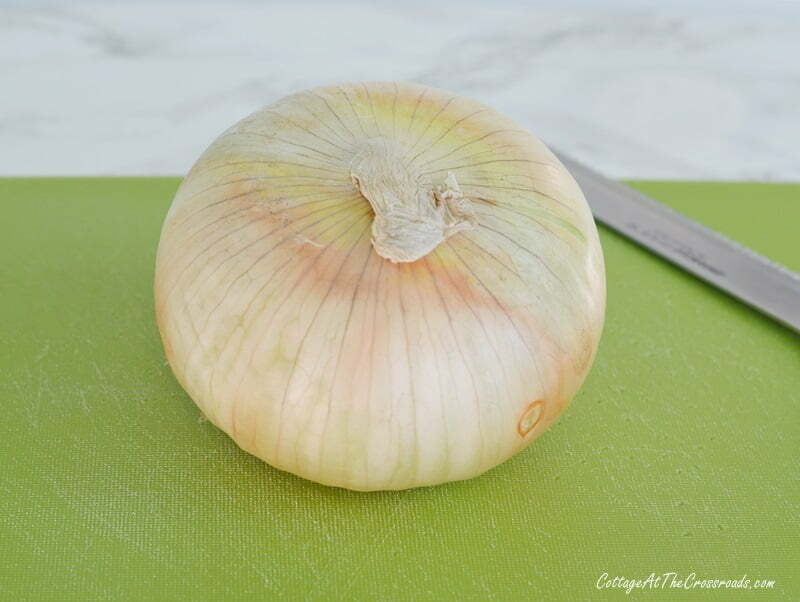 Place your onion on a cutting board and slice off the top of the onion. Turn over the onion and just barely trim off the roots. You don’t want to cut off much from the bottom because that is what will keep the blooming onion intact. Peel off the skin and discard. Turn the onion back over and cut the onion into quarters. Be very careful to stop cutting when you are about 1/2 inch from the root. In each section, make 3 more cuts. Continue making cuts until you have 16 total cuts. Place the cut onion into an ice bath for at least 1 hour. This helps the petals open up so it can bloom! Take the onion out of the ice water and pat dry. In a small bowl, whisk together 2 beaten eggs and 1/4 cup milk. Place the onion in the egg mixture, gently open the petals, and spoon the egg mixture down inside each petal. In another small bowl, mix together 2/3 cup Panko breadcrumbs, 1 teaspoon Creole (or Cajun) seasoning, 1/2 cup all-purpose flour, 1 teaspoon garlic powder, and 1/2 teaspoon each of salt and pepper. Take the onion out of the egg mixture and place the onion in the bowl with the dry mixture. Use your hands to sprinkle the dry mixture down inside the petals and press the mixture on the outside of the petals. Don’t worry if you don’t get every petal completely coated. Place the onion on a baking sheet lined with aluminum foil that has been lightly greased with a small amount of oil. Create a tent with additional foil and loosely cover the onion. Bake the onion covered for the first 5 minutes, remove the tent, and bake for an additional 15 minutes. Mix together 1/3 cup mayonnaise, 2 tablespoons sour cream, 1/4 teaspoon paprika, and 2 tablespoons wing sauce. You will need to hollow out the top of the onion to fit a small container of the dipping sauce in the blooming onion. Serve immediately while the onion is warm. 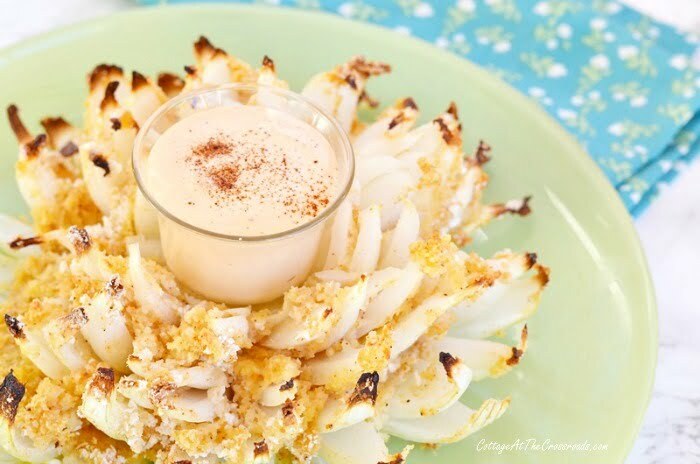 Enjoy the popular restaurant blooming onion appetizer without all the calories. 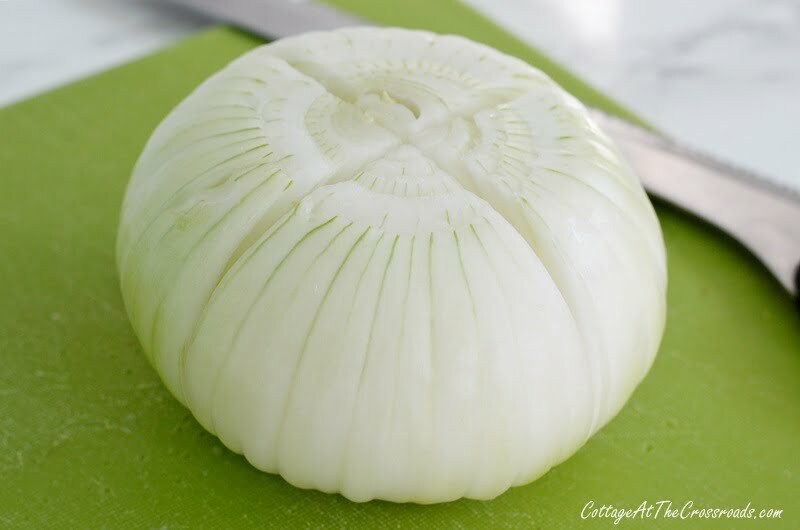 Place the onion on a cutting board and slice off the top of the onion. Turn over the onion and just barely trim off the roots. Turn the onion back over and cut the onion into 4 quarters, being very careful to stop within 1/2 inch of the root. In each quarter section, make 3 additional cuts. Continue making cuts until you have 16 total cuts. Put the cut onion into an ice bath for at least 1 hours. This helps the petals open up. Take the onion out of the ice water and pat dry. 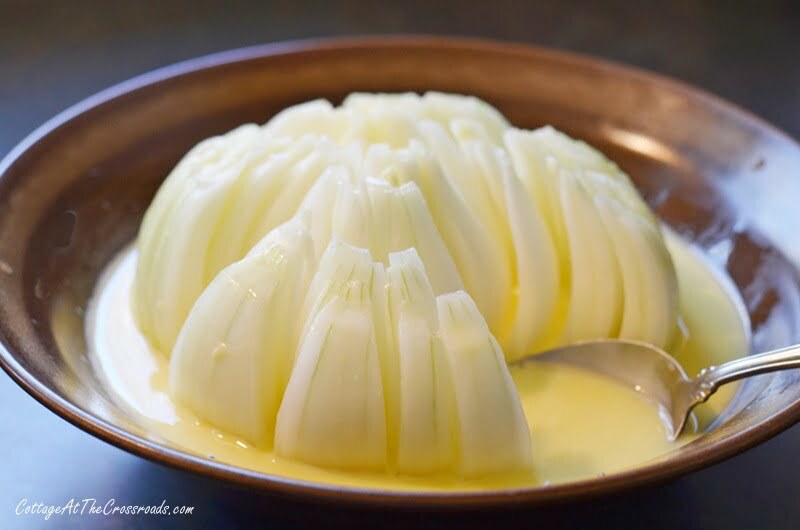 In a small bowl, whisk together the beaten eggs and milk. Place the onion in the egg mixture, gently open the petals, and spoon the egg mixture down inside each petal. 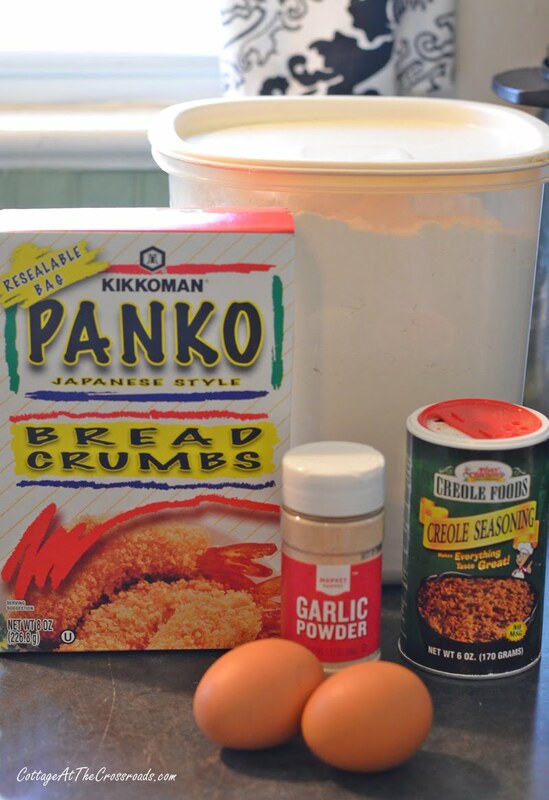 In another small bowl, mix together the panko breadcrumbs, flour, creole seasoning, garlic powder, and salt and pepper. Take the onion out of the egg mixture and place the onion in the dry mixture. Use your hands to sprinkle the dry mixture down inside the petals and press the mixture onto the outside of the petals. 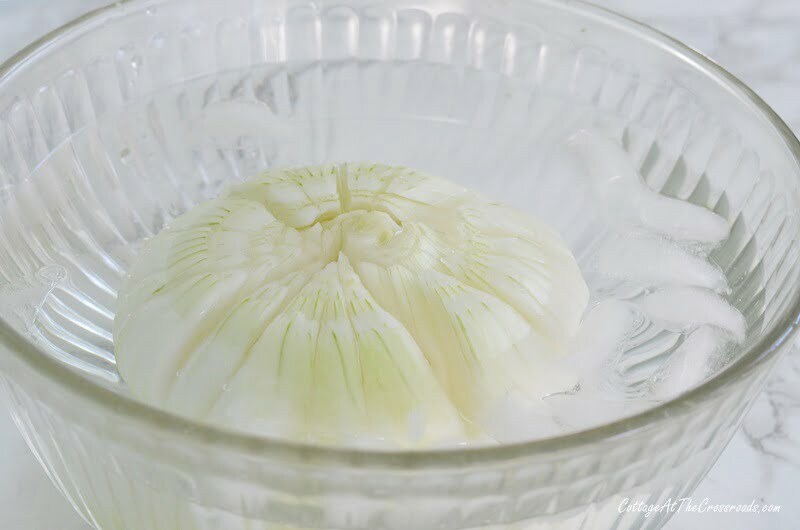 Place the onion onto a baking sheet lined with aluminum foil that has been lightly greased with a small amount of oil. Create a tent with additional foil and loosely cover the onion. Bake covered for 5 minutes, remove the tent, and continue baking for an additional 15 minutes. Mix together the mayonnaise, sour cream, paprika, and wing sauce. 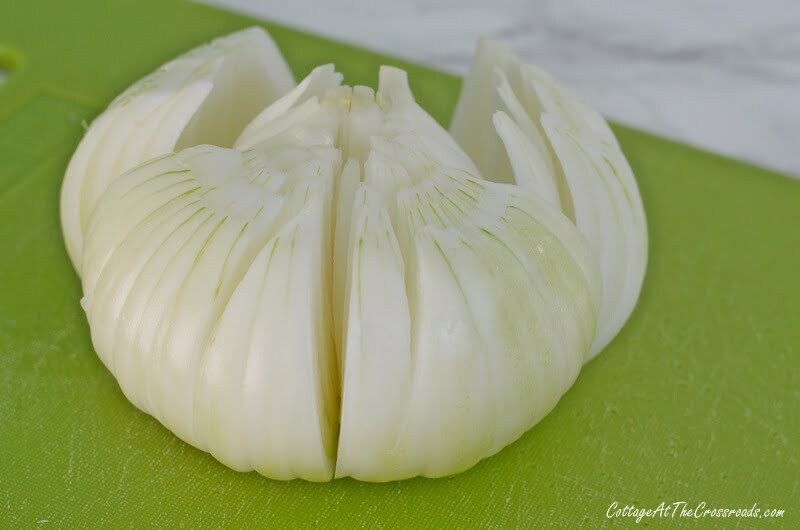 Hollow out the top of the baked onion in order to fit a small container of the dipping sauce in the blooming onion. Sprinkle a small amount of additional paprika on top of the dipping sauce, if desired. Reduce the calories even more by using reduced fat mayonnaise and sour cream in the dipping sauce. 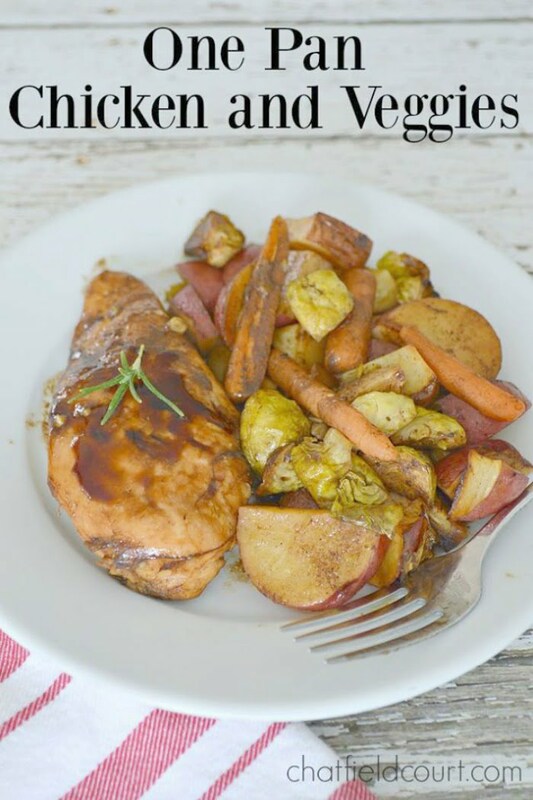 If you’re looking for even more healthy menu options, check out these two recipes below. The first one is from my friend Julie from Redhead Can Decorate. 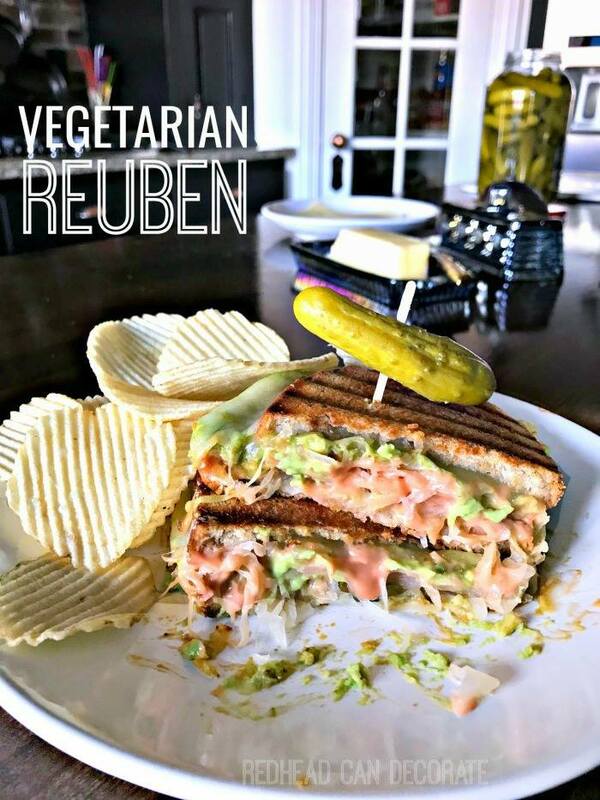 She’s figured out away to lighten up a reuben sandwich! Give her a visit to get the recipe and then check out how she and her husband have totally transformed their home with their awesome DIY projects. And the next recipe is from my friend Kristi who blogs at Chatfield Court. 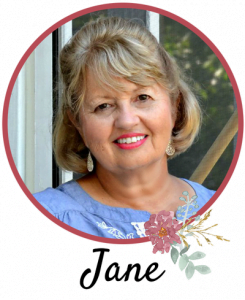 After you go over to get her recipe, you may want to poke around on her blog because she lives in a beautiful, authentic stone cottage! Enjoy your weekend, folks, and stay warm! I’m such a sucker for these that I avoid the restaurant that makes them so well!!!!! I printed out the recipe and can’t wait to try it. I’m thinking a salad and this would make a dinner. Oh, that looks yummy! I’m definitely eating healthier this year after eating out way too much last year. This looks delish, Jane! I love that it’s baked and not fried. I’ll definitely try this out on my husband. I know he’ll love it! Oh my!!! I am totally making one of these bad boys for Rick & I. I better make one for Daphne & Vic, too! I had no idea how easy this is!! Thanks, Jane! I will have to try this for my husband. I am not a big onion fan:( They make a gluten free panko too which isn’t so bad. That is a biggie for us. 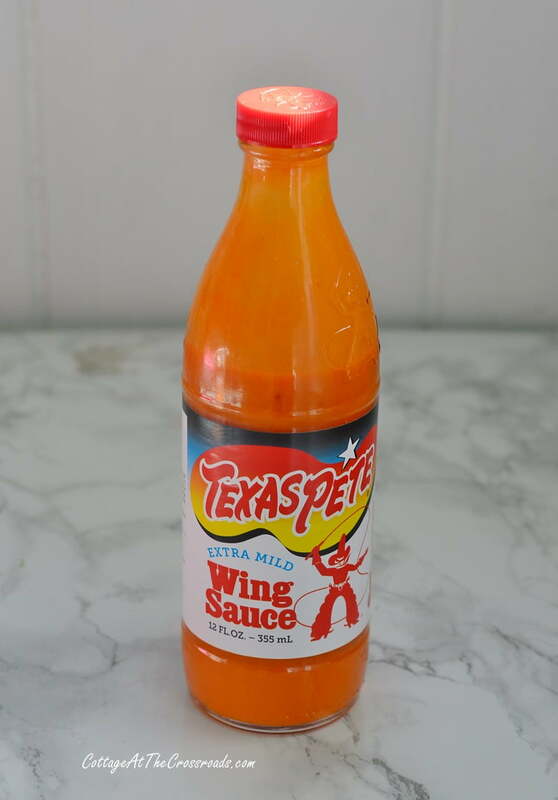 And Hubby can’t have too much hot sauce. I have a bloomin onion one but it is high calorie and takes longer. I’m going to try this one! I hope you like it, Susan! It won’t be quite as crispy as a deep-fried one but it is equally delicious!